Is Deep Sea Fishing in Destin Right for You? Destin is a wonderful, warm, and scenic destination in coastal Florida. There is no question that what brings so many visitors to Destin is the water. The blue waves and the clear Gulf of Mexico offer the chance to enjoy a wide variety of watersports such as jet skiing, snorkeling, boating, and parasailing. 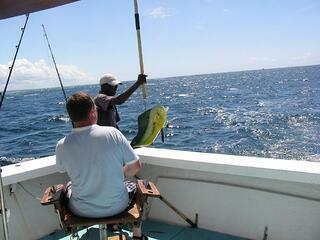 One of the more popular water activities in the Destin area is deep sea fishing. Destin has earned the moniker “World’s Luckiest Fishing Village.” If you're thinking about deep sea fishing while you’re vacationing in Destin, here are some questions to ask yourself to see if this activity is a good choice for you and your group. Do You Want to Captain Your Own Boat While in Destin? A lot of people want to charter a boat while in Destin that they can captain themselves. If you don't have a lot of experience in this area, you are probably not the right candidate to charter a deep-sea fishing boat. Typically, these boats are captained by a local expert with a crew to ensure you have a successful and fun day of fishing in the Gulf. Destin Harbor has the largest fleet of state and federally-permitted charter boats in North America. You’ll have little trouble finding someone else to be the captain of your voyage. If you want to control your own boating itinerary for the day, consider a boat charter that isn't intended for deep sea fishing. A pontoon boat, for example, is a great option to tour popular areas in the Destin Harbor and Choctawhatchee Bay. If you want to go deep sea fishing in Destin, or anywhere else for that matter, you need to give motion sickness more than a fleeting thought. While some have no issue with motion sickness in a car, they find out firsthand that they do have an issue with seasickness. Boating in the open sea is quite different that boating in a lake and even varies depending on which sea you’re on. Water chops and swells and chops vary from location to location and day to day. There are several options for offsetting sea sickness that range from prescription medicines to positioning yourself to catch any available breeze. It isn’t cheap to charter a deep sea fishing trip and nobody wants to spend the entire time hanging over the railing. It’s also important to remember children are more prone to seasickness than adults. If there are young children in your group or if you think there’s a better way to spend the day than hurling off the starboard side, you can still enjoy a day of fishing. Consider fishing off the deck of a pontoon boat in the calmer waters of the harbor and bay. What Types of Fish Are You Hoping to Catch? There’s no doubt booking an offshore fishing expedition is an incredible experience and a popular option for people vacationing on the Emerald Coast. Fishing off the coast of Destin offers opportunities to snag some great species of fish including Amberjack, Trigger, Grouper, Snapper, Cobia, King Mackerel, and even Sailfish from time to time. However, if you want to keep a little closer to shore, charter a pontoon boat in Destin and fish in the calmer waters of Choctawhatchee Bay. Just some of the many fish you can snag include Redfish, Grouper, Speckled Trout, Flounder, and Spanish Mackerel. Fishing from a pontoon boat is a favorite activity for families, particularly for those who have young children or have members of the group who are prone to motion sickness. Will Deep Sea Fishing Be a Fun Activity for the Whole Family? If you have ever tried taking the whole family fishing for hours at a time, you might already know how hard it is to capture—and keep—the interest and attention of a large group. This is particularly true if you're planning for all ages! Deep sea fishing in Destin can be fun for a lot of people, but it isn't always inclusive for all ages. Young children might get bored or seasick, and if you are part of a multi-group charter, the boat can’t simply turn around and bring only your group back. Plus, a full day of serious deep sea fishing involves patience and waiting around, both of which aren’t strong suits of most kids and teens. Again, some individuals prefer a pontoon boat charter for fishing in Destin. This is a much more flexible option that allows you to fish in the Destin Harbor or the Choctawhatchee Bay. With a double-decker pontoon boat, there is something for everyone. For a small fee, anglers can fish, sunbathers can listen to their favorite tunes via Bluetooth while they work on their tans, and everyone will love the dual water-powered slides built right into the boat from the top deck. Deep sea fishing is an exciting outing for many, but it’s important to think about these questions and others to determine if it’s the right activity for your group. There are other options for fishing while in Destin, including beach and inshore fishing. Novice to experienced anglers will enjoy fishing from a pontoon in the tranquil areas of the bay and harbor areas. Double Fun Watersports offers the extremely popular double-decker pontoon boat charter that can accommodate up to 12 people. Contact us today to reserve your double-deck pontoon for a perfect day fishing and fun on the water.